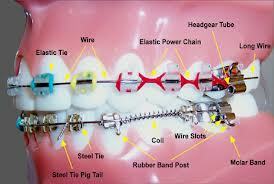 The purpose of this section is to illustrate different types of common orthodontic and orthopedic appliances. Orthodontists use many different types of “appliances,” the word for braces or other devices, to move or stabilize teeth and jaws. Sometimes an orthodontic treatment involves more than just moving the teeth. The official name of the specialty is Orthodontics and Dentofacial Orthopedics. Let’s look at what that means. -dontic, or dento- means teeth so Orthodontics means to straighten teeth. -pedics- means "the child", so Dentofacial Orthopedics means to straighten or correct the face and jaws of the child. Orthodontists do more than align teeth; they modify and correct problems with facial growth. 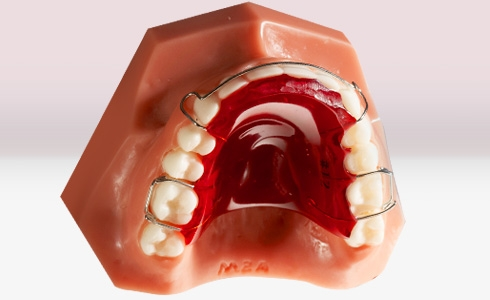 Different orthodontic appliances are used for different purposes in an orthodontic treatment. Some are designed to primarily move teeth (orthodontic), while others are used “orthopedically” to modify facial growth. Some appliances have both orthodontic and orthopedic treatment effects. Appliances come in two types: ones that are fixed, or don't come out, and ones the patient can take out. The kind the patients can take out are called “removable.” The orthodontist selects either fixed or removable appliances based on an individual patient’s treatment needs and how much cooperation or compliance (following the orthodontist’s instructions) can be expected from the patient. Removable appliances are easier to keep clean, but can be lost or misplaced. Fixed appliances are worn all the time and are often indicated for problems that require a more aggressive or time-sensitive treatment. Patients who have trouble wearing removable appliances can often be treated with fixed appliances. Examples of fixed orthodontic appliances are the brackets, bands and wires most often associated with “braces.” Brackets can be made of metal, ceramic or plastic or combinations of these materials. Some metal brackets are silver-colored, but some are gold-colored. Ceramic brackets are typically clear or tooth-colored and are generally used by patients who want to minimize the visibility of their braces. Other fixed orthodontic appliances are pendex appliances, distal jet appliances and coil springs of different materials are used primarily to move teeth. Devices such as Forsus springs or Jasper jumpers are often used in place of elastics, but all share a common purpose of making upper and lower teeth fit together better. Lip bumpers may be used for patients with lower arch crowding. Your orthodontist may also use some fixed devices to hold teeth in place while other teeth are moved. These common appliances include lingual holding arches, Nance appliances and transpalatal arches. A quad helix is an appliance made of heavy wire that moves teeth, but can also have an orthopedic effect. These types of appliances may have other names, but have common uses. Examples of fixed orthopedic appliances are the various types of palate expanders and functional appliances. Palatal expanders are used to make the upper jaw wider. The Hyrax and Haas expanders are examples. Functional appliances are used to normalize growth discrepancies between the upper and lower jaw. Examples of these are the Herbst appliance, twin block and Mara appliances. These are typically worn over extended periods of time. Removable orthodontic appliances can have many shapes and appearances. “Retainers” are examples of one type. 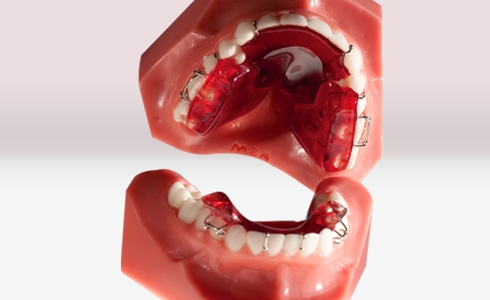 Retainers usually just hold teeth in their new positions after active orthodontic treatment (braces) is complete, but springs or elastics can be added to these types of appliances to move teeth. Rubber bands, or “elastics,” are used in almost every treatment to help move teeth into a correct position. Expanders and tooth movers come in many shapes and forms. The illustrations show only a few. The orthodontist can prescribe and construct individual appliances suited to a patient’s individual and unique needs. There are also removable orthopedic functional appliances that help correct growth discrepancies. Bionators and Frankel appliances are examples of those. Various types of headgears are also commonly used removable orthopedic correctors. Some, such as cervical pull or high pull, help to correct conditions when the lower jaw growth does not keep up with upper jaw growth, while other types, such as reverse pull headgear, face masks and chin cups, help when upper jaw growth does not keep up with lower jaw growth. Orthodontists select the type of appliance that suits each patient's needs from these and other appliances. As you can see, appliances can be as different as each patient seeking orthodontic treatment. You can trust your orthodontist to choose the appropriate appliance for your treatment because orthodontists have two-to-three academic years of university-based specialty training in orthodontics and dentofacial orthopedics.